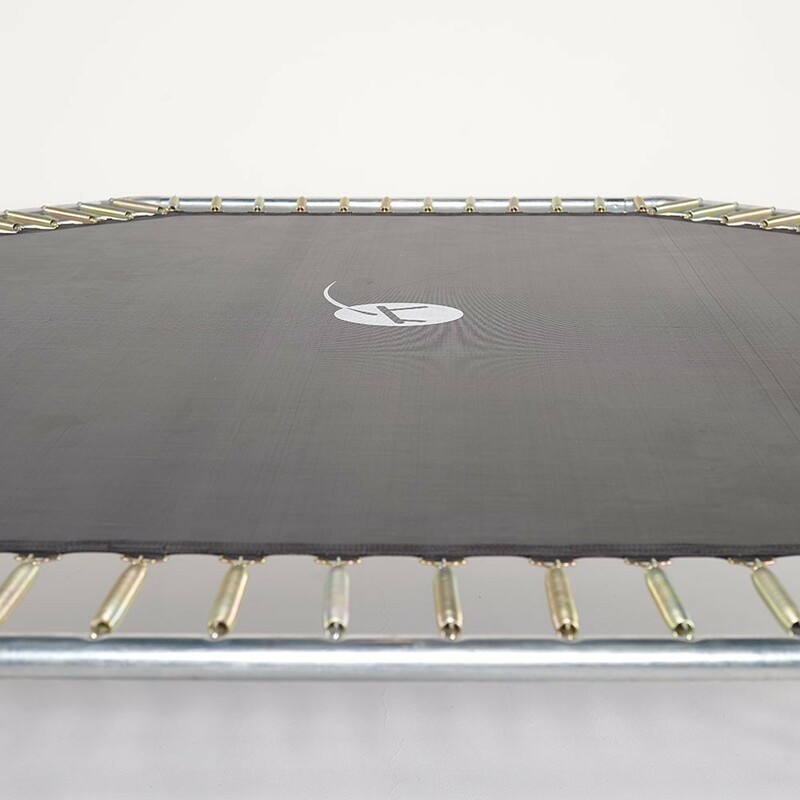 Jumping pad for your Waouuh 360 trampoline with 88 springs of 230 mm. 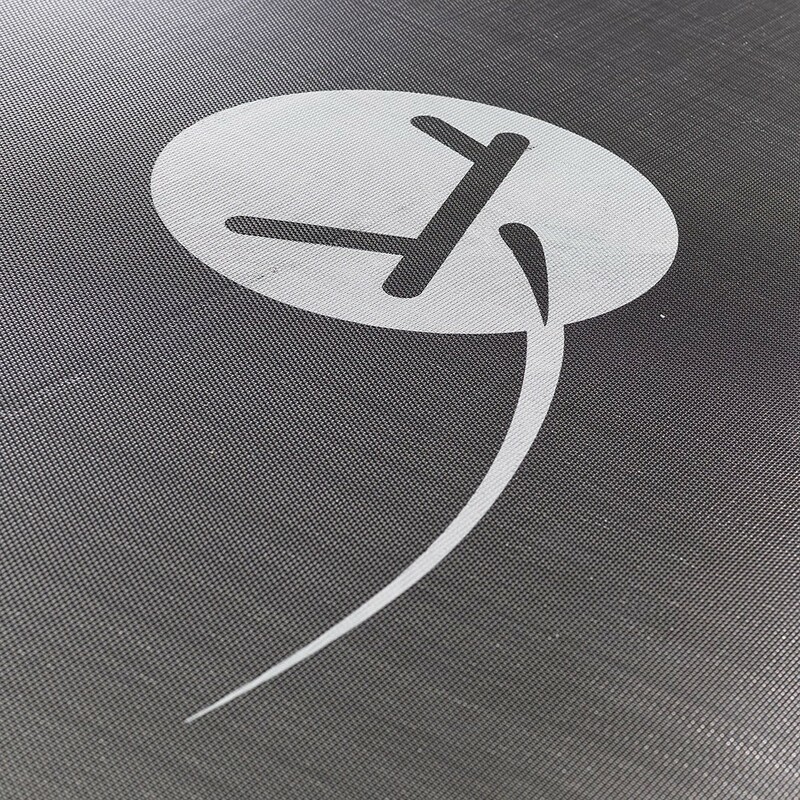 Do not hesitate to replace your jumping mat if it is damaged. 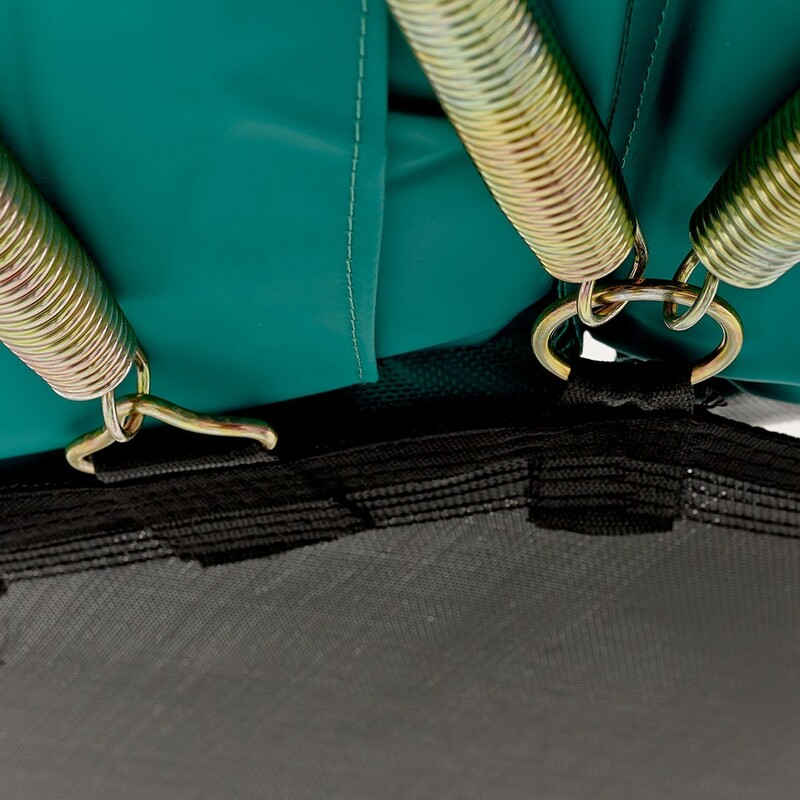 This spare jumping mat is adapted to octagonal trampolines of 3.66 m by 3.35 m with 88 springs of 230 mm. 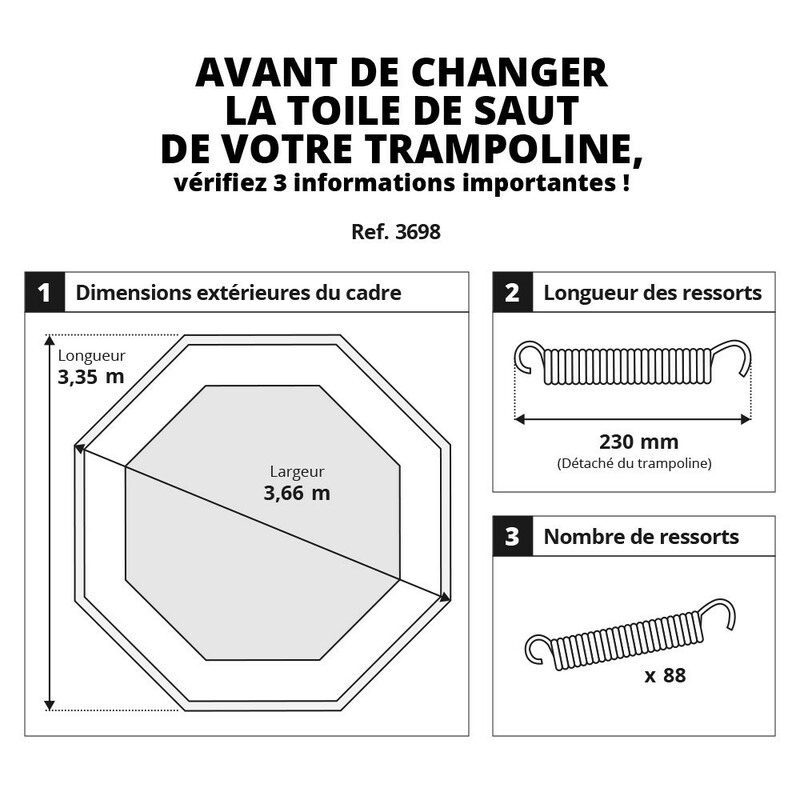 It can also be fitted to trampolines with the same characteristics that have been bought elsewhere then at France Trampoline. 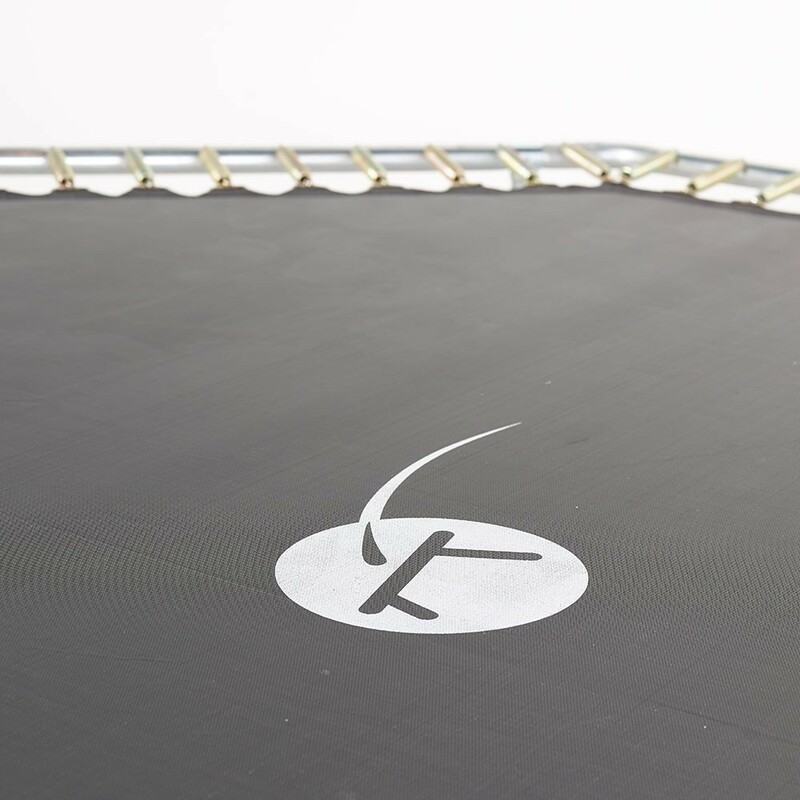 - This jumping mat is also adapted to our Waouuh 360 trampoline but also any trampoline with a diameter of 3.66 m by 3.35 m with 88 springs of 230 mm in length. 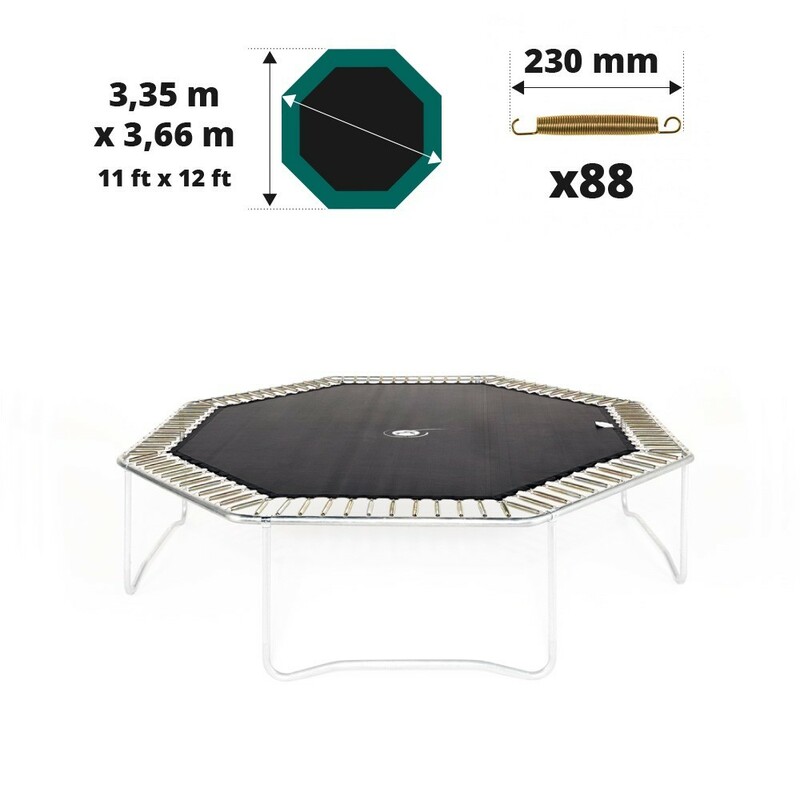 To ensure you have taken the right measurements, measure the exterior diameter of the trampoline with the help of a second person. - We can guarantee the quality of this product through the fabric used, polypropylene or mesh, which is known to be highly resistant. It has been UV protected; the sun will no longer damage your jumping mat. 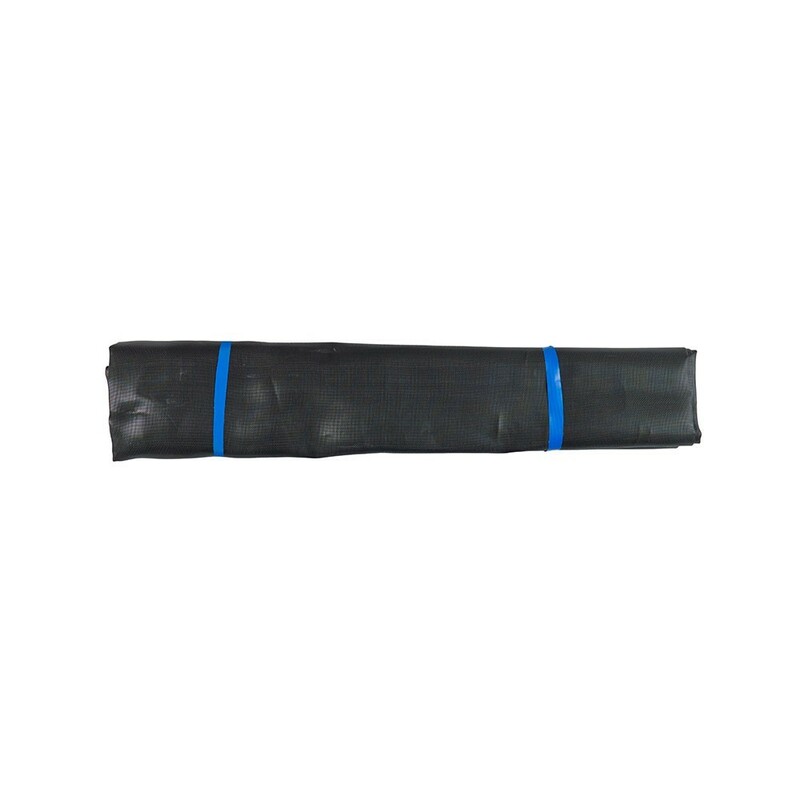 - Our products are designed to be resistant; the 8 rows of stitches as well as the strengthening strip guarantee this. For even better resistance, triangular hot-dip galvanised rings are fixed to end of these rows. They are also rust-proof. 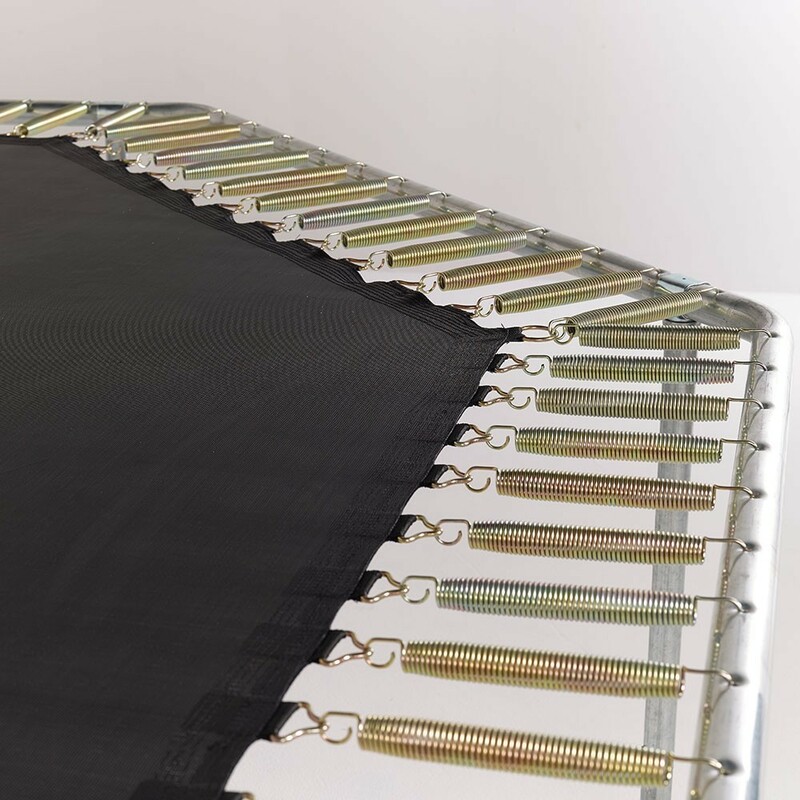 - Warning, this jumping mat is only adapted to trampolines with 88 springs of 230 mm in length. 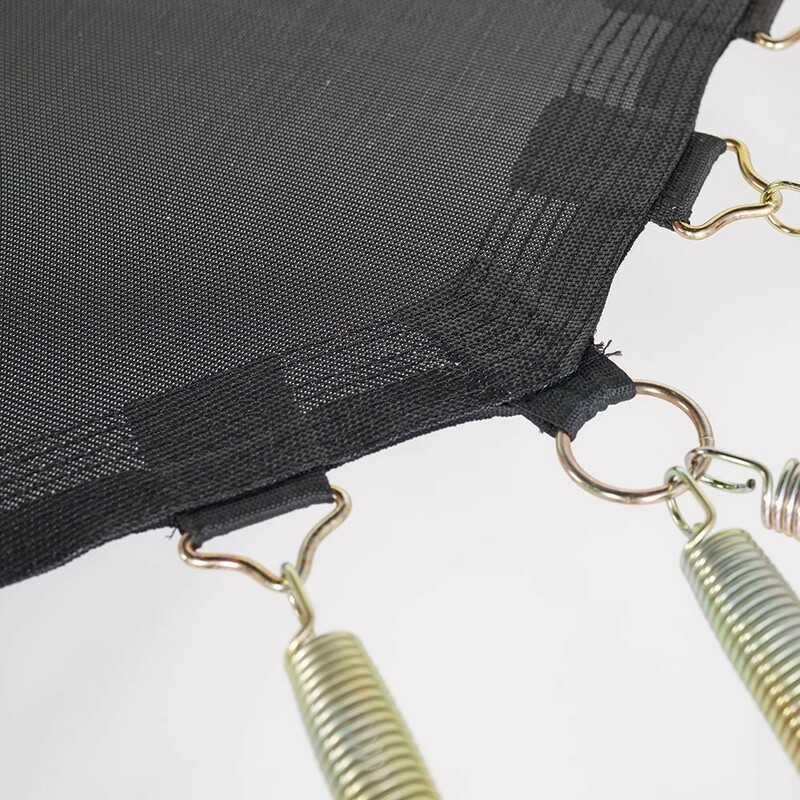 It is important to measure the springs carefully so as to order the right jumping mat. 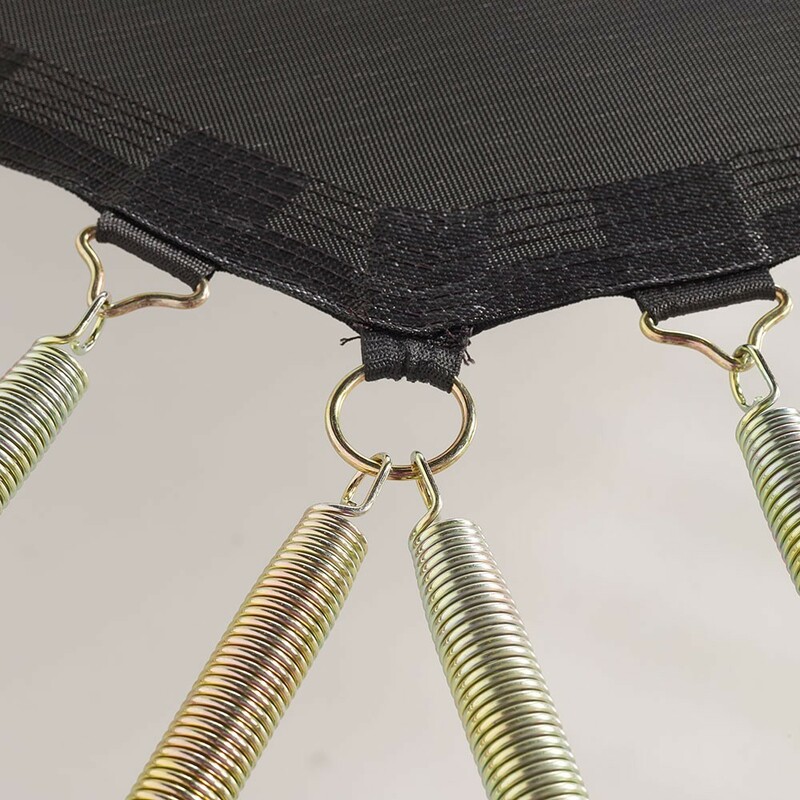 All you will need to do is remove a spring from the trampoline, by pressing down in the centre to free the hook. You will therefore be able to remove the spring from the framework. Then you should measure it from hook to hook.